The book is compiled and published by Claremorris man, Pat Walsh. 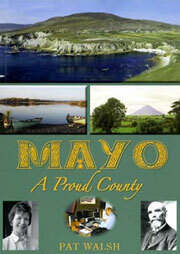 Mayo is the third largest County in Ireland. Its western seaboard and its remoteness from the Capital city resulted in a breed of people who had learned to work hard and fend for themselves. The people and projects mentioned herein are testimony to this. God compensated by endowing the County with natural beauty. I have long been amazed at the 'Mayo-God-help-us' attitude of people who should know better and I have been surprised by the ignorance of many on this little island (3 hours x 5 hours) who have never visited the counties of Ireland. So many Mayo people have 'stood up and been counted'. So many have risen to the top in their various professions, that we are indeed proud. I hope that this little book will surely show that God has indeed helped us.